The Streamlight Stinger Rechargeable Flashlight provides bright clean light without the need to continuously switch out batteries! The Stinger comes with a 3.6 volt rechargeable battery that lasts for up to 6 hours on a single charge. The scratch resistant lens ensures the bright beam from the powerful LED bulb is clean and clear every time! 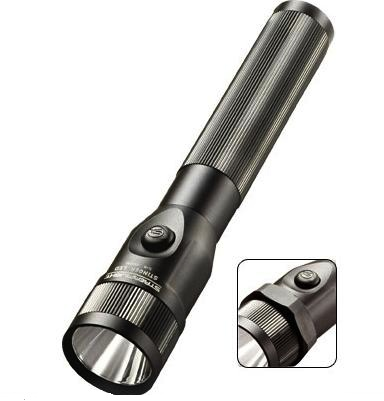 This handheld flashlight is constructed with machined aluminum anodized against corrosion inside and out, so it will last through all of your outdoor adventures. The Stinger includes a 120-volt AC charger and a 12-volt DC charger with 2 snap in holders.